$20.00 each or 2 for $35.00. Plus sizes extra. 4 days until the greatest show in Western Canada! Whos excited? I know we are! Come check out Vendors from across Canada! Biak's normally $550.00. On sale for $450.00! All are eating frozen thawed rats or mice. They are not picky. They will eat your finger if you give them a chance. We have 5 Aru's and 6 Biak's. 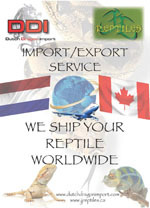 Only 18 days until Western Canada's largest Reptile Expo! Make sure to check it out! This weekend, May 5th and 6th, the Edmonton Reptile and Amphibian society will be hosting another great show. If you are in the area stop by and check it out. 12340 Fort road at the Sands hotel. Our new aquatic amphibian rack arrived today. We have been waiting for this for a while now. Check in to see what we end up putting in it.